Nieces. That’s my excuse for going to see this. So what’s the producers excuse for what they’ve done to a beloved childrens’ TV character? Why, when they make a feature length movie, do producers want to take the very thing they presumably paid a lot of money for the movie rights, then turn it into something else? Postman Pat The Movie is like a throwback to 70’s sit-com spin-offs; take a successful TV property, then take it on holiday; sacrifice the familiar elements that make it what it is, then ditch the characters, the setting and any of the plotting and turn it into… a shallow imitation of itself. In a very thin set-up, Pat wants to take his wife on holiday to Italy, but can’t afford it (excuse me but even postmen can afford two tickets on Ryan Air to somewhere vaguely Tuscan). So we have to leave Greendale and Jess the cat behind, so Pat can enter a TV talent contest not a million miles from X-Factor, where the prize is … a trip to Italy; and what do you know, he has a voice just like a member of Boyzone… Ronan Keating’s. 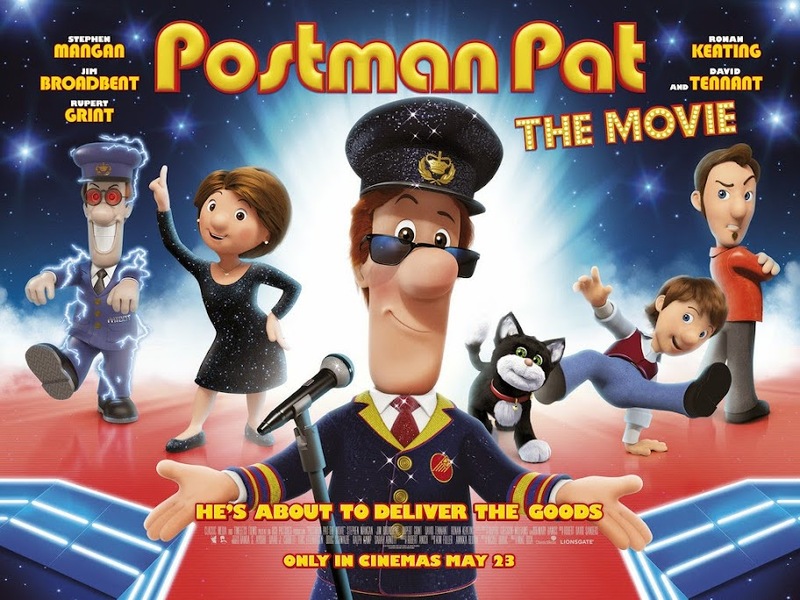 Postman Pat The Movie is steeped in pop-culture, with the whole X-Factor parody, a wicked host in Simon Cowbell and the terrible acts on the talent show including Rupert Grint. So far, so-so. Back in Greeendale, we get the wholly un-Postman Pat sci-fi apocalypse, Postman Pat-meets-The Terminator; the latest Royal Mail efficiency drive is to replace the postmen with robots. In a massive anti-capitalist, anti-globalisation plot twist, David Tennnant’s super-slimey corporate Post Office manager threatens to make Pat redundant. I’m sure the under-fives appreciate the radical politics. Of course, the Pat-bots suffer a huge malfunction and turn into scary Cybermen with red glowing eyes; I thought that might scare the littler kids in the audience, but, brought up on Dr Who, they’re evidently made of sterner stuff. Although, to be honest, Wallace and Gromit did it better with Preston the Cyber-dog in A Close Shave. Passing mention should be made of the under-used Jim Broadbent, superb as Pat’s gaffer. Next to bigger, better, more original animations, there’s not enough budget to compete with Ice Age or Toy Story, and not enough knowing jokes for the parents; who else but the movie buffs will remember The Postman Always Rings Twice (not exactly an age-appropriate reference)? Certainly nobody with children under ten. Oh, and there’s nearly two hours of it. Madness. I think the main problem is it’s just not Postman Pat enough. We’re not driving the van around Greendale enough with Jess the cat. Postman Pat’s speaking voice does not sound like Stephen Mangan (Green Wing, Dirk Gently). Nor does his speaking voice match Ronan Keating’s singing voice. The famous ear-worm of a theme tune only fleetingly crops up in the background. Worst of all, the glossy, 3-D CGI animation isn’t a patch on the good old-fashioned clunky stop-motion animation of the TV show.